I get asked a lot about sugar substitutes and what I recommend. 1st of all, if you have any insulin sensitivities, you need to steer clear of all artificial sweeteners. 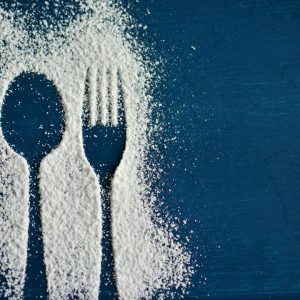 Artificial sweeteners like Splenda (sucralose) and aspartame (which has been shown to raise insulin levels as much as sugar) worsens insulin sensitivities and are just bad news for everyone. To put is simply, when you consume these artificial sweeteners that have no calories (sounds great, right? ), your body gets confused and goes looking for calories. This leads to cravings which leads to eating more, which leads to more cravings which leads to fat gain. Diet soda anyone? Yeah, definitely a rabbit hole of doom and destruction (too dramatic?). When it comes to fruit, the assumption is that since it’s natural, you can eat as much as you want. However, your body can only process a small amount of fructose (about 15 grams) a day. More than that and your liver is affected. If your goal is fat loss, opt for lower glycemic fruits like berries. Aim for less than 5 grams of sugar each meal. If you don’t have insulin sensitivity issues, here are my top recommendations. 1. Xylitol is a found in fruits and vegetables and is also found in our bodies. The kind made from hardwood trees is best. Avoid the ones from China or sourced from corn. My preference is the Xyla brand. Xylitol from the right sources is tolerated well by the majority of people and has even been shown to help prevent cavities. Still, it’s best to start with small amounts to be sure your system can handle it as gas, bloating and diarrhea can be prevalent if sourced improperly or too much is introduced at once. It is easy to cook with and doesn’t have the bitter aftertaste some people detect in stevia. 2. Stevia is far sweeter than sugar meaning a little goes a long way. And not all stevia is created equal. You want to find pure stevia with nothing added and the liquid form is usually less bitter than the powdered. Although stevia provides no calories, it does not have the same effect on insulin that artificial sweeteners do. Having said that, those with severe insulin sensitivity still need to use caution and moderation with this or any other sugar alternative. The sourcing of stevia can also be suspect. I like SweetLeaf liquid stevia, but honestly, if we all just grew and dried our own we’d be living dietary goals! 3. Erythritol occurs naturally in some fruits and mushrooms. Like xylitol, it is also a sugar alcohol and should be consumed in moderation, especially as your system gets use to it. Like xylitol and stevia, it’s been shown to have little to no effect on blood sugar and is a decent alternative to sugar when not over-consumed. 4. Monkfruit is 300-400 times sweeter than cane sugar. Make sure what you get doesn’t have molasses or any sugar alcohols added. It has been used as a sweetener for centuries and has many purported health benefits such as being high in antioxidants called mogrosides which have no effect on blood sugar, lowers risk of obesity and diabetes, acts as an anti-inflammatory, combats infection, works as antihistamine, has cancer-fighting properties, and fights fatigue. Whew!! Think it might be worth looking into and giving a go? Keep in mind that even though these are good alternatives, they should still be used in moderation. Information is power! Here’s to your health! How do I know if I have insulin sensitivity? I’m so glad you asked, Barbara! You are at an increased risk if you had gestational diabetes, have high blood pressure, are considered obese, or if you have a family history of Type 2 Diabetes. Women who are more apple-shaped (carry most of your weight in their abdomen) also show less of a tolerance for insulin. The good news is that the combination of diet and exercise can have a huge effect, and even reverse it. Many simply jump on the exercise bandwagon and think they are doing enough, but diet plays a huge role (between 75-90%), so if we are tending to our health in both areas, we have a better chance of correcting our insulin sensitivity. I do have insulin sensitivity but I wasn’t a fan of the sweet leaf drops. What should the people with insulin issues use sparingly of course? Christal, if you have insulin resistance, then sounds like Monk Fruit might be your best bet. But yes, the key word is sparingly until things get more normalized.